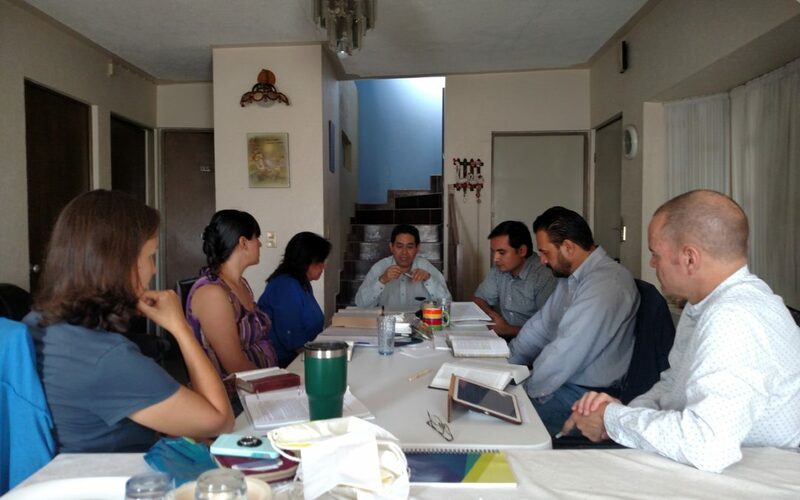 I just returned from Aguascalientes, Mexico where I teamed up once again with Peter Sholl of MOCLAM (Moore College Latin America) to teach an intensive course on the Pentateuch (pictured). The class was well attended with 7 students. I was expecting leaders from 2 of the area churches but was pleasantly surprised to have 5 leaders representing all 3 of the churches in the area. The best thing to happen was when I was teaching on the 10 commandments. When we got to commandment number 4 – remember the Sabbath – I asked the leaders about their Sabbath, if and how they took time for rest and refreshment. The discussion went on for 10 to 15 minutes. At lunch I asked if they ever took time to get together for fellowship, sharing and to pray for each other. No, they said, this was the first time they had ever taken time to talk and share with each other. Then I made a suggestion, “while we’re all here together, why don’t we take some time to pray for each other?” Also, “Can I encourage you guys to do this on a regular basis? It is so important.” Immediately they began making plans as to how and when they could get together next. It was a totally unexpected opportunity to speak into the lives of these hard-working ministers. I love it when God surprises me like this and orchestrates one of His divine appointments.